After millions of times driving by The Spanish Kitchen, I finally decided to check it out. 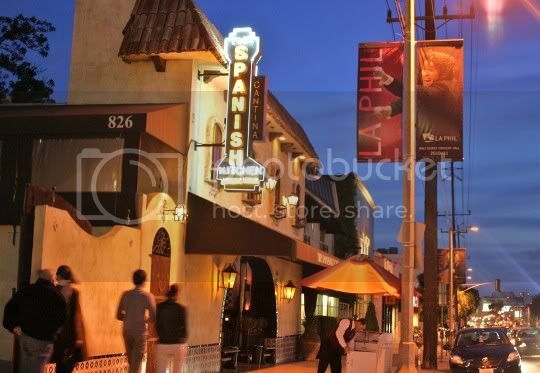 The seemingly trendy and always-bustling restaurant on the West Hollywood-La Cienega strip constantly beckoned to me; its online menu looked fabulous, complete with tequila tastings, Taco Tuesdays, and what looked like a wide range of vegetarian options. The restaurant is actually quite large, consisting of a covered patio, an enclosed patio and fireplace, a main bar, and a large room of tables and booths. Choose to dine in one of the patios, and you're sure to have a great people-watching experience. The evening lighting is kept dim, and there's a constant flurry of activity (especially during the daily happy hour, which is where most of the goings-on seemed to be). The ambiance is warm and inviting, and the colorful tiled floor and walls, murals, and plants almost lend to the authenticity of an early period Mexican kitchen. The customer service here is excellent, although the pace of both the kitchen and bar seemed ridiculously slow. My server did make sure to check in with me from time to time: not too much to be annoying, but just enough to keep me from huffing and puffing. I asked him questions about certain menu items regarding my veggie restrictions, and he assured me no lard is used in any of the food. Standard corn tortilla chips, non-non greasy and lightly salted. They came out warm, which is always a good thing. 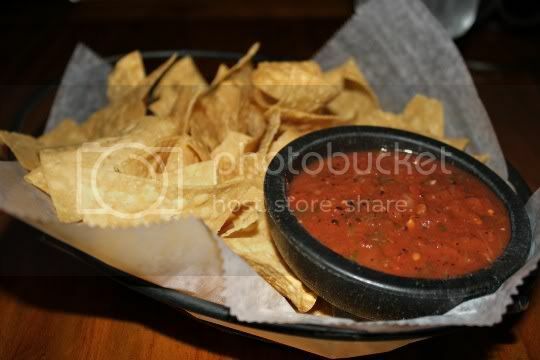 The tasty salsa was served chilled, and had a roasted tangy flavor with just enough necessary heat. Whew, I see why the happy hour here is so popular! For a drink that's half-price, this baby was strong! Very strong! And a nice size too! Now normally I'd say $12 is pretty ridiculous for a margarita (although not so surprising for the restaurant's location), but for the strength and size of this drink, the happy hour price of $6 is the ultimate steal. 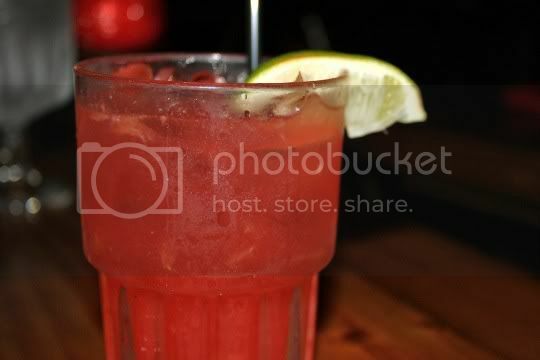 The margarita wasn't super sweet, but the "blood orange" packed a definite punch: tart, bold, and full of flavor. I suppose the bit of sweetness in it is from the pomegranate, and also a dash of sweet and sour mix. 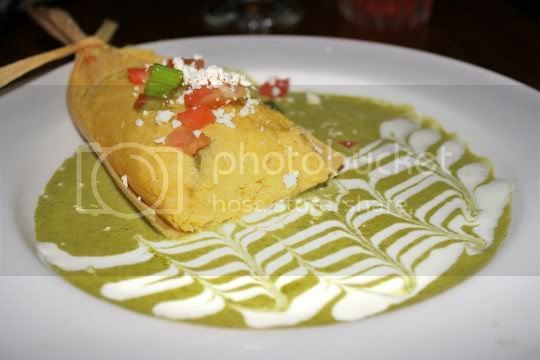 Now THIS is a real corn tamale (pay attention Border Grill). Although the corn masa mix wasn't terribly sweet and could have used a little more seasoning, I at least got what I was expecting a real tamale to be. The surprising element of this dish was the green sauce sitting underneath. The menu describes this as a salsa poblano, and while I couldn't tell exactly what was in it, I know it was definitely delicious. Rich, strong, and salty with an almost odd earthy flavor. I'm sure it was just the roasted poblanos, but I would almost say I tasted a bit of mushroom and tomatillo flavor. The richness of it made me think there's probably some kind of cheese or cream in it as well, but let me tell you, I could not stop eating that sauce. In fact, I think the crema served with it is almost unnecessary, although it does make for a great presentation. As tasty as the sauce was, I do think the actual tamale would have gone better with something tangy (like the salsa served with the chips), but I still ate every bite! 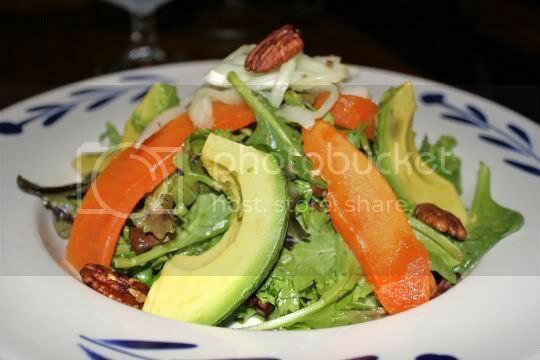 I loved the presentation for this salad: piled high, colorful, and just the perfect size for the price. The papaya (which I've never actually had in a salad) was perfectly ripe, sweet, juicy, and refreshing. In my opinion, avocado works in pretty much anything, and that didn't fail here...although I would have preferred thinner slices as opposed to the chunky quarters. The thinly sliced onions on top were a surprise (as they weren't mentioned on the menu), but they were tangy and marinated with a strong infusion of oregano...and they were so good! The pecans didn't seem "spiced" to me (as mentioned on the menu), and I think some kind of sugary coating or glaze would have gone great in the salad. Everything was tossed in a sweet and tangy honey-lime dressing, which was the perfect amount and didn't result in any soggy greens. A salty, creamy cheese would have been excellent here, and maybe even some pickled chilies. Still, I'd definitely order this dish again. To my surprise, this was probably my least favorite of the meal. I tend to rate Mexican restaurants by two things: guacamole and cheese enchiladas...and these were just not the greatest. In fact, I'd say they were almost too...Americanized. 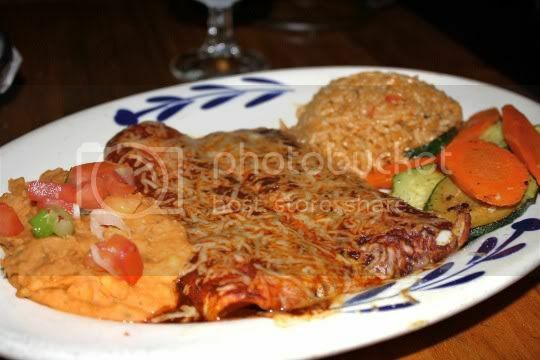 I'm used to the kind of enchiladas that are drowning in ooey-gooey cheese and rich sauce, but these were actually dry. The combination of manchego, cheddar, and chihuahua cheeses weren't even melted all the way through. The cheeses didn't stretch; instead, they were soft and slightly grainy. The roja sauce just barely covered the enchiladas, and it was tangy and smoky, with lots of bitter chile powder flavor (probably arbol?) and heat that starts to sneak up on you. The refried pinto beans (you also have a choice of refried black or whole black) were bland and slightly bitter, and while the rice was flavorful, it seemed mushy and overcooked. I did like the side of sliced carrots and zucchini, which were buttered and perfectly seasoned and sauteed. Unfortunately, I probably wouldn't order these again...or at least, I wouldn't be expecting the "real" enchiladas I'm used to. 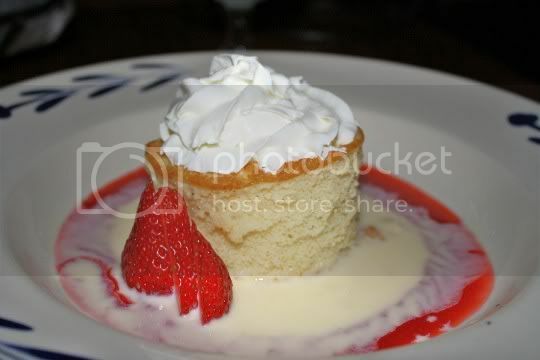 I lovvvvvve tres leches cake, so of course I had to order this traditional Mexican dessert. Unfortunately, the sweet-salty cake was a bit dry and spongy, and not completely soaked through with milk mixture like it should be. But that milk mixture was definitely laced with rum, which really kicked things up! In fact, the bottom of the cake seemed to be absolutely drenched in rum flavor (yum!). Similar to the tamales, the highlight of the dish actually seemed to be what was on the bottom. Here's where all of the super sweet rummy milk sauce resided, along with some of the most delicious strawberry puree I've ever tasted. Seriously, I could have eaten the milk sauce and puree by itself. This dessert could have gotten additional points had the whipped cream on top been REAL; this was clearly the canned kind, as it was too light and started to melt about halfway through eating it. Come on now, use real whipped cream! Anyway, the cake is very rich, but it's the perfect size for a solo dessert (or for two people who are watching their calories). I'd certainly return to The Spanish Kitchen, with hopes of trying some of the other vegetarian salad, appetizer, and side dish options. Oh, and of course for the happy hour drinks and and festivities!